Chocolate. Bailey’s. Whipped Cream. More chocolate. Heath Bar. SERIOUSLY. Bailey’s Chocolate Freezer Pie is it. Do you need a pie for a holiday? Any holiday. St. Patrick’s Day, perhaps? Christmas? New Year’s? A birthday? I just love the stretch between Thanksgiving and New Year’s. I look for as many opportunities as possible to cook up a feast – really, just an excuse to make more desserts. Some years, we are lucky enough to have a Friendsgiving in addition to a traditional family Thanksgiving. Thanksgiving is such a great holiday, why not celebrate it twice in one week? 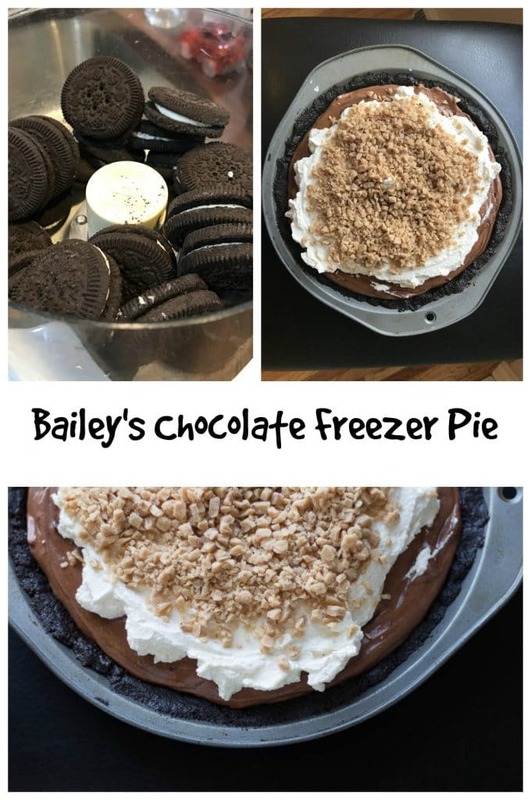 This Bailey’s chocolate freezer pie originated at one of our Friendsgivings and we have made it every holiday since – big and small. 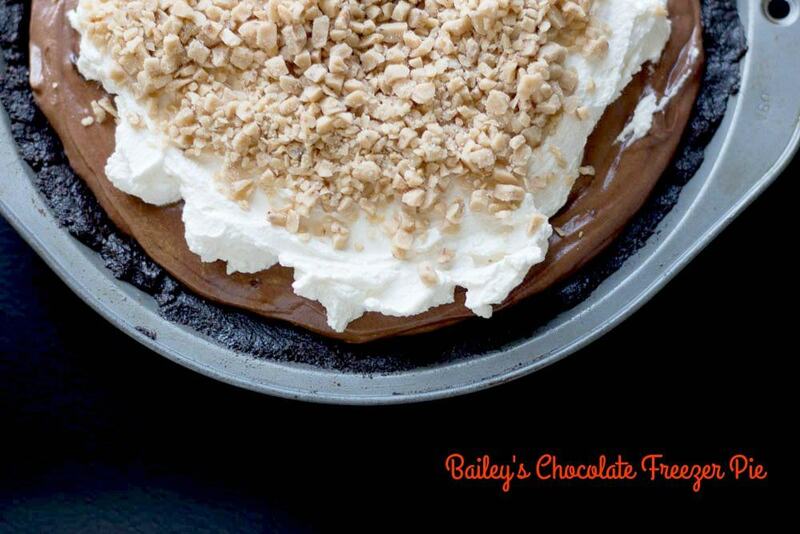 ]This Bailey’s Chocolate Freezer Pie is requested all year long. Although not a traditional choice, the Bailey’s chocolate freezer pie is usually the hands-down favorite of the evening. It tastes just as good for breakfast in the morning with a gorgeous cup of coffee. This pie is surprisingly easy to make but it will WOW your guests. If you don’t have Bailey’s on hand, skip it, just this once. I have made it with and without Bailey’s and it is delicious both ways. The Bailey’s puts it over the top, but this pie is still pretty darn good without it. 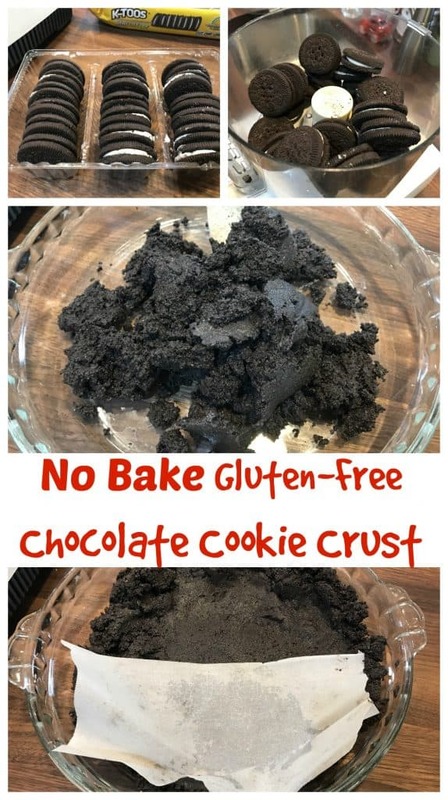 A note about chocolate cookie crusts: I like to make my own chocolate cookie crust because we need to keep it gluten-free here but, if you can take the shortcut, grab a premade cookie crust at the store if you want to save a step although making your own crust is super easy! 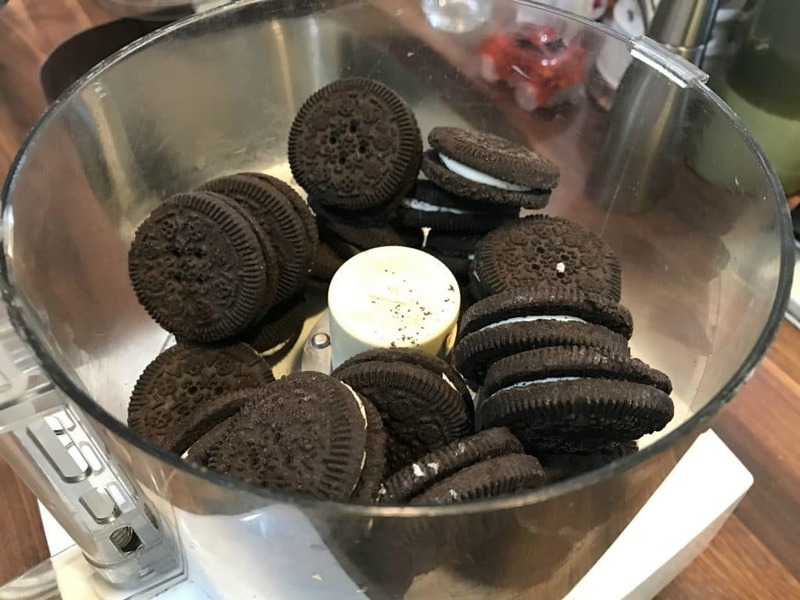 To make your own cookie crust, you just need chocolate cookies, butter, and sugar and a food processor. 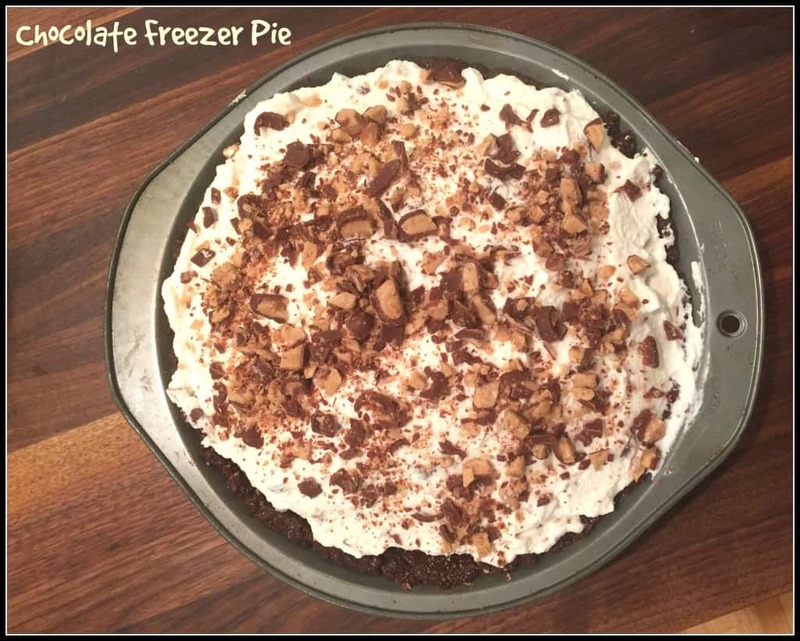 For this chocolate freezer pie, I use about 2 cups of gluten-free chocolate cookies, 1/2 cup of melted butter, and 3 tablespoons sugar. Combine in a food processor and then press into your pie pan. Freeze the pie crust while you are preparing the chocolate freezer pie layers. 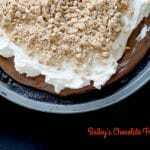 This Baileys Chocolate Freezer Pie will become a family holiday favorite! Combine marshmallows, chocolate and milk in a microwave safe bowl. Heat on 50% power for about a minute and a half - have your children watch the marshmallows expand exponentially! Stir. Heat for another minute on 50% power. Stir. Add about a shot of Baileys (or your favorite liqueur). Stir. The chocolate will be shiny and smooth. Set it aside and let it cool. In a stand mixer, mix the whipping cream on med-high to high until it looks like delicious whipped cream. Organic whipping cream will really taste better! Take about 1/2 to 2/3 of the whipped cream and fold it into the cooled chocolate. By folding, I mean to plop some whipped cream into the chocolate and then use a spatula to incorporate the two together - do not use a spoon and stir it or the whipped cream will deflate. Spoon the chocolate cream mixture into a 9-inch cookie pie crust. Fold about 1/2 cup of the Heath Bar Bits into the remaining whipped cream. Spoon evenly over the chocolate. Sprinkle the remaining Heath Bar Bits over the top of the pie. Cover and freeze for at least a few hours. This is a great pie to make a few days ahead to save yourself some last minute hassle. Enjoy!! This is pretty genius. I approve. LOL I can imagine eating this year round actually! Thanks!! It is decadent but so easy to make! Win-win. Oh my goodness, this look like heaven! Thanks, Marye! It really is delicious. Omg, this sounds and looks amazing!! I am already thinking about New Year’s desserts and this is looking pretty darn enticing! I love everything about it! Thanks, Kacey! I am with you on New Year’s Desserts! This tastes DECADENT! Perfect for a new year’s fete! pie with Baileys…count me in! It really is a perfect combo! Wow! This looks and sounds so amazing! I can seriously imagine eating a big slice in the a.m. with my coffee! Nice! Thanks, K.D. It tastes amazing! I never would think to serve this at a Friendsgiving, but right now–I am craving all things baileys and chocolate!! This looks great! Thanks, Kristen!! Bailey’s and chocolate is a FABULOUS combo!! I love Bailey’s, and I think I need to make this SOON – it sounds so good! YES, Kristina!!! If you like Bailey’s, you will LOVE this easy pie.